“Future Machine” at Bellevue Arts Museum is an ever-changing meditation on what we value and what we don’t, and what that might mean in the years to come. Technological breakthroughs? Societal collapse? A salvage operation on the past? 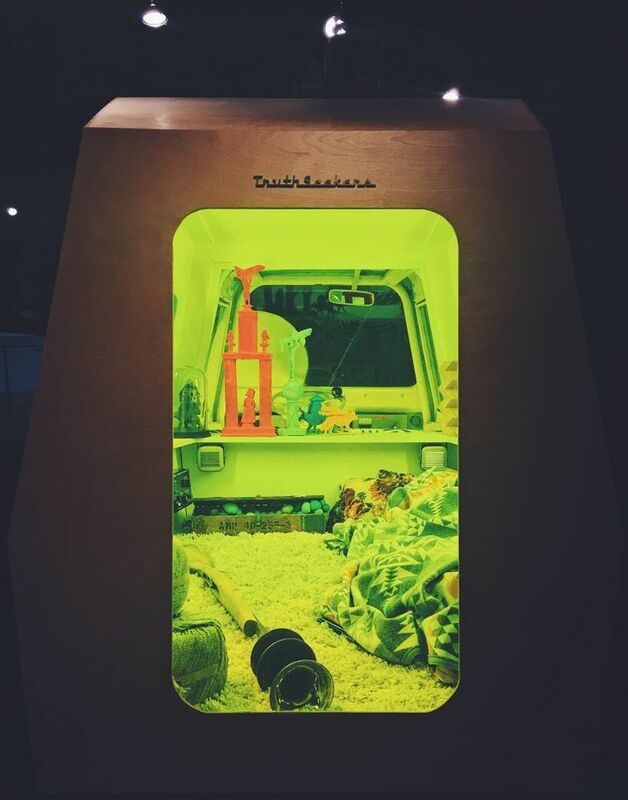 The four artists in Electric Coffin – Patrick “Duffy” De Armas, Justin Kane Elder, Stefan Hofmann and Taylor Reed – lean toward the latter possibility. 11 a.m.-5 p.m. Wednesdays-Sundays, 11 a.m.-8 p.m. First Free Fridays, through Sept. 10. Bellevue Arts Museum, 510 Bellevue Way N.E., Bellevue; $5-$12 (425-519-0770 or bellevuearts.org). Their installation at Bellevue Arts Museum, “Future Machine,” attempts to “recontextualize” old materials in a new setting. Its centerpiece is a refurbished 1984 Cushman Truckster, the type of three-wheeled vehicle that parking-enforcement officers drive. The more you examine the van, the more you see. Its interior is scattered with model-railway scenery items, a small library, an array of control panels and bundled stacks of $100 bills. An M98 Respiration Simulator is on hand, in case the whole business takes your breath away. Connected to the van by thick, twining rope is the “Future Machine” of the show’s title. It’s an old oscilloscope (an automotive diagnostic tool whose function, these days, is taken care of by a microchip in your car’s computer system) festooned with all sorts of things, including a satellite dish, whose probing “antenna” is actually a length of vacuum-cleaner hose. That, anyway, was the setup in February. In April, two more large installation components appeared: a ceiling-to-floor cascade of stuffed toys and a charred wall-mounted sculpture assembled from discarded books. This “Future Machine,” it seems, does not stand still. 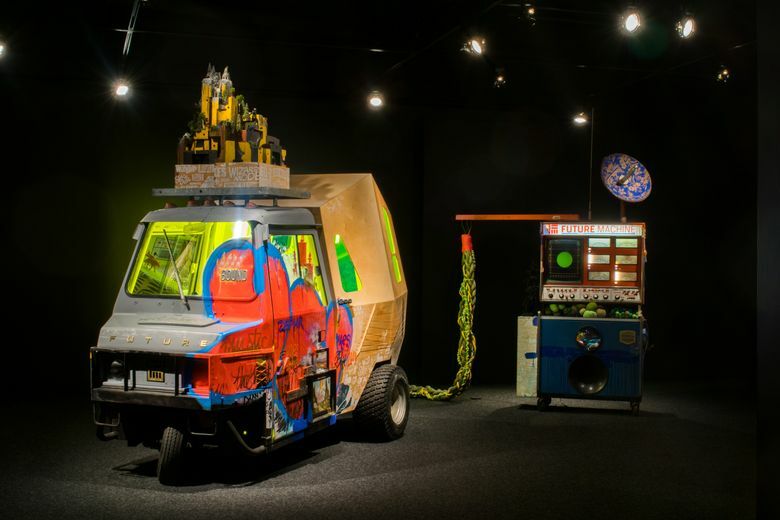 Electric Coffin, the zany force behind “Future Machine,” is a hybrid art enterprise that has one foot in the commercial world and one in the fine-art world. In its commercial work, EC has to keep their clients’ return on investment in mind. At Westward restaurant on Lake Union, for instance, EC’s “boat installation” behind the bar is designed to lure patrons into ordering a second drink so they can take in its details more thoroughly. Or so Elder says, his tongue only half in his cheek. EC’s fine art projects have a more activist bent. For Earth Day, 2016, they erected a “Rethink Reuse™ Clothing Spill Installation” on Alki Beach consisting of half a dozen or more waste barrels, some seemingly floating 10 feet in the air, from which torrents of secondhand garments issued. With “Future Machine,” their first museum show, uncompromised creativity has guided their can-do craftsmanship and personal aesthetic. The project is evolving in five distinct phases: “Idea,” “Fuel,” “Mechanical,” “Illumination” and “Future.” Each phase is accompanied by a panel discussion. “Fuel” is the first phase to involve collaborators: ceramic sculptor Gustavo Martinez, Savers (the recycling operation that supplies Value Village with its goods) and the Onni Group (redevelopers of the old Seattle Times building at 1120 John St.). Martinez’s contribution is “Guardian Warrior,” a functioning ceramic incense burner perched on that cascade of stuffed toys. Savers’ and the Onni Group’s contribution was access to found materials. The book installation, for instance, incorporates printing rollers (dubbed “prayer wheels” by EC) that were salvaged from the old Times building. Obtaining the rollers was an eerie experience. EC members entered the abandoned building with representatives from Onni and some Seattle police officers who’d cleared the building of all its squatters, except for one holdout who was rumored to be armed with a can of bear mace. Different groups of people had trashed the place. There was graffiti everywhere, including spray-painted directions on where to buy crystal meth. Most of the valuable material, including all the copper piping, had already been removed. Still, a massive amount of old machinery remained. EC’s Taylor Reed says it took him a full day to recompose himself after wandering through the squalid mess. The second addition to “Future Machine” was also an eye-opener for the EC team. Savers’ distribution center in Fife is filled with thousands of pounds of goods, including plastic-wrapped bales of stuffed toys weighing between 700 and 800 pounds each. EC sees an “intrinsic value” in such supposedly worthless items. The aim of “Future Machine” is to expand that bandwidth.